A standout track from the first Van Halen album, Ain’t Talkin’ ‘Bout Love began life as a satirical commentary on the late 70s punk scene. Initially, Ed was unsure about the song. He felt it was a trivial tune, maybe too simple, and was actually reluctant to bring it to the band. He shouldn’t have worried. It went on to become one of the most popular Van Halen songs, remaining on the concert set list to the present, almost twenty years later. In Ain’t Talkin’ ‘Bout Love, Ed’s sound was never browner. He processes his patented and imme­diately recognizable cranked Marshall tone with phasing (MXR Phase 90) and echo (Echoplex tape delay) for a particularly attrac­tive greasy result that colors the arrangement perfectly. Ain’t Talkin’ ‘Bout Love is classic Van Halen, straight from the kegger beer bashes and backyard parties of the San Gabriel Valley in Los Angeles. It may not be about love, but it’s about youth, energy, and the freedom to cruise. Gut-level rock ‘n’ roll for the ages. Tune all strings down one quarter step (between E and E flat). Van Halen’s intro riff sets the mood for the entire piece. The heavy percussive effect in the figure is a result of Ed’s very musical use of palm muting. With the punchy, overdriven amp tone and the effects grease, the muting lends a thick­ness to the notes that makes them sound posi­tively obese. Van Halen applies the palm-mut­ing technique to an arpeggiated version of the verse chord progression, Am-F-G5 in open position [Fig. 1]. What is compelling about this simple pattern is the interval jumps. The com­monplace three-chord figure is transformed into something very special by Ed’s wide inter­val picking of the basic shapes. This approach creates an angular melody emphasizing skips like a sixth (E up to C), a fifth (A up to E), a fourth (F down to C), a seventh (A up to G) and a twelfth (D down to G) [Fig. 2]. The G-C-B-C bass line melody is a thematic element in the song occurring in all the important rhythm fig­ures. The main riff, Rhy. Fig. 1, is first heard in the introduction and later becomes the primary chord hook in the choruses. It is composed on two chords, Am and G5, and again incorporates that thematic bass line melody. The verse riff Rhy. Fig. 2, is a modified version of the intro figure. Here, it is found in a simpler, more stream lined form, but nonetheless includes arpeggition and those interesting motivic interval jumps. Ed’s solo is melodious and thematic, creating a pre-composed, as opposed to improvised statement that fits the song perfectly. This is Van Halen’s answer to Neil Young’s “Cinnamon Girl” solo. The melody is simple, jangly and played entirely on the B string, with ample use of the open E (1st string) as a drone throughout the main section (first five measures). To further strengthen the jangly effect, Ed overdubbed a sitar to double the solo. He heats it up in the final phrase with a rolling blues ostinato lick. The repeating is an Eddie signature and makes use of a familiar stylistic lead pattern, heard also in “Eruption,” “Somebody Get Me a Doctor” and many other other Van Halen tunes. It’s built from a blues scale shape in the box position [Fig. 3]. To get it down, begin by playing each note of the four-note pattern slowly, concentrating on the flow, smoothness in legato (hammering-on and pulling-off) and rhythmic regularity. Gradually speed it up and strive for a rolling effect – as if each four-note group was a spoke in a spinning wheel. Ed is a master at incorporating all types of harmonics into his guitar parts. In the third verse, he adds open harmonics to the figure. These are played over the frets instead of between the frets, as in normal fretting [Fig. 4] To demonstrate, lightly touch the 4th string over the 7th fret and pick it. You’ll hear a higher-pitched tone, almost bell-like, one octave above the normal lower-pitched note you’d hear if you were pressing. That’s the A harmonic. Van Halen typically plays these in groups, an over the fingerboard, as if they were chords and this is what we find in this section. His harmonics occur over the 5th, 7th and 12th frets the most common and usable locations for open harmonics on the guitar. 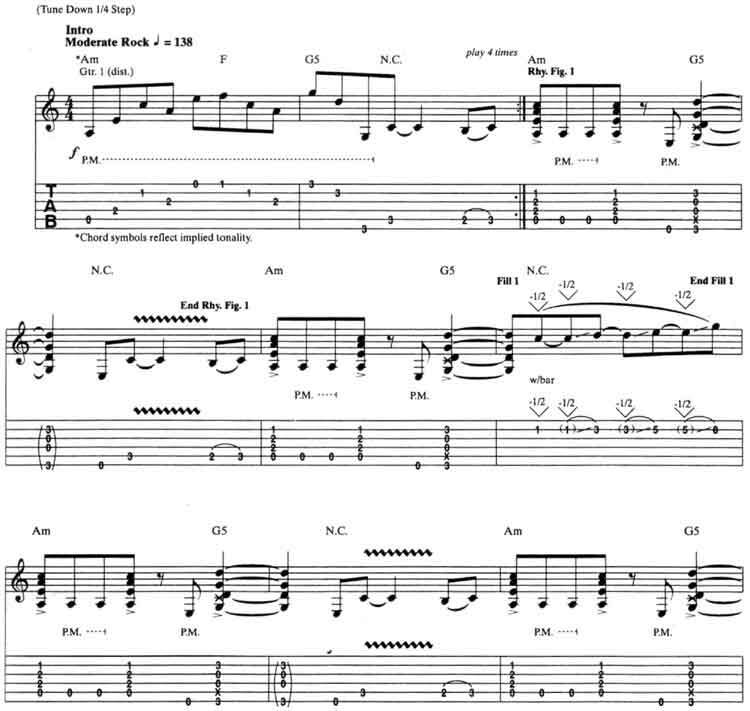 It’s a part of Van Halen Ain’t Talkin’ ’bout Love guitar tab and sheet. © 2012 - 2019 TabsClub Powered by TabsClub 42 queries in 0.259 seconds.